Terminal 1 of the IGI Airport has also been connected to the metro network through this corridor that will take the total length of the DMRC network to 277 km. With the 24.82 km-long Janakpuri West-Kalkaji Mandir corridor of the Magenta Line inaugurated yesterday, the latest addition to the DMRC network is now fully functional. The other half, the 12.64 km-long Botanical Garden-Kalkaji Mandir corridor was inaugurated last year on December 25 by PM Modi. The newly-opened route that opened for public today will provide a lot of relief to commuters, especially those travelling from Noida to Gurugram. The travel time between the two cities has been cut down to 50 minutes now. Delhi CM Arvind Kejriwal and Union Minister for Housing and Urban Affairs Hardeep Singh Puri flagged off the new corridor yesterday. The first train that was flagged off on the corridor was at Nehru Enclave metro station that was boarded by Kejriwal and Puri to Hauz Khas station. "I would like to congratulate the DMRC engineers for achieving this feat and also the people of Delhi on the opening of this line. The coming of this Metro line will reduce traffic jams and will also help bring down pollution levels," said Kejriwal during the inauguration, as mentioned in a report in Hindustan Times. Terminal 1 of the IGI Airport has also been connected to the metro network through this corridor that will take the total length of the DMRC network to 277 km. Puri said that the length of the network will increase to 380 km by December this year. The Magenta Line, with 16 stations will operate with 24 trains initially which will gradually increase to 26. The 16 stations on this corridor include Janakpuri West, Dabri Mor, Dashrathpuri, Palam, Sadar Bazar Cantonment, Terminal-1 (Indira Gandhi International Airport), Shankar Vihar, Vasant Vihar, Munirka, RK Puram, Hauz Khas, IIT, Panchsheel Park, Chirag Delhi, Greater Kailash, and Nehru Enclave that will join the other half of Kalkaji Mandir, Okhla NSIC, Sukhdev Vihar, Jamia Milia Islamia, Okhla Vihar, Jasola Vihar Shaheen Bagh, Kalindi Kunj, Okhla Bird Sanctuary and Botanical Garden. 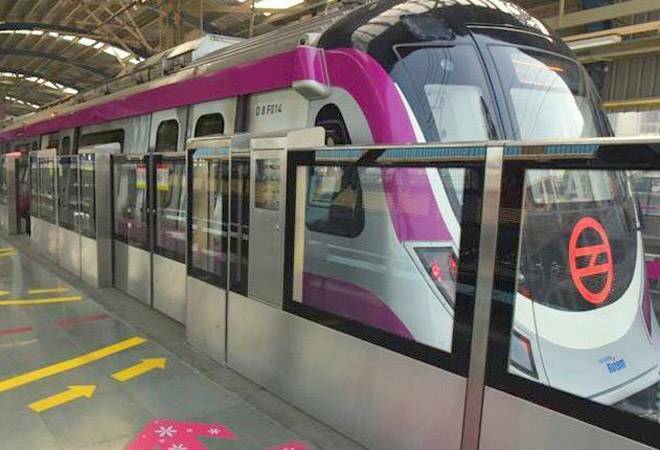 The Delhi Metro is also touting the Magenta Line as a 'Knowledge Corridor' as four major universities of the Delhi-National Capital Region (NCR), have been connected on it. Jawaharlal Nehru University (JNU) and Indian Institute of Technology (IIT) now have metro connectivity with the opening of the new corridor, while Jamia Milia Islamia University in South Delhi and Amity University in Noida were already connected with the Botanical Garden-Kalkaji Mandir section.